When you hire an electrician you expect things done right and at a fair price. Our highly-trained, licensed, and insured electricians understand this and can deliver just that. Our highly-trained licensed and insured electricians are ready to handle the electrical projects for your business. Our certified Appleton-area electricians have the training, tools and experience to repair all types of residential and commercial electrical issues. Bell Electric is a competitive source for all your audio and video needs, including complete system design and install services. Most of us take power for granted, until it’s gone. Then our minds quickly think of everything in our homes that won’t work without it, and how much damage the absence of power can cause. Are you looking for an electrical contractor that offers complete electrical services in Residential, Commercial, Industrial, and Service? Bell Electric has a proven track record of providing quality service, along with the latest technology, to their customers for everything from a simple repair to a complete electrical system. 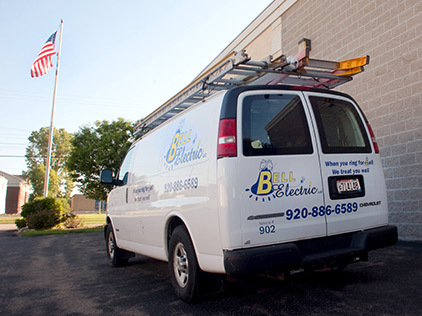 Bell Electric services the Fox Valley and surrounding areas (including Appleton, Neenah, Menasha, Omro, Oshkosh, Fond du Lac, Kaukauna, Kimberly, Combined Locks, Green Bay, and DePere) with all your electrical needs.